After entering the twenty-first century, biochar has become a focal point of multidisciplinary research because of its special characteristics, broad application, and promising development prospects. Basic and applied research on the application of biochar in the areas of agriculture, environment, and energy have increased dramatically in the face of food security, environmental pollution, and energy shortage. Although there are some disputes about biochar research, many studies have demonstrated the importance of biochar research from the perspective of scientific advancement and practical application. 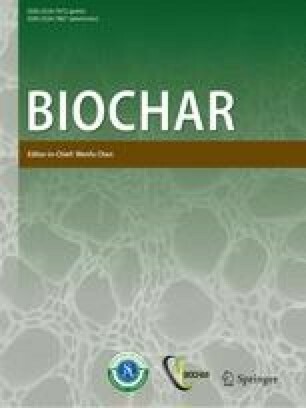 This paper briefly recalls the history of biochar application; introduces research progress on the basic characteristics of biochar and its associated production technologies; summarizes the research status and existing problems of biochar application in the areas of agriculture, environment, and energy; and analyzes the potential problems and development trends of biochar research in the future. Biochar, a term that is both new and ancient, generally refers to the carbon-rich solid product when biomass is thermally decomposed under anoxic conditions (Lehmann et al. 2006). As a typical biochar precursor, charcoal has been closely related to human civilization since the Paleolithic era of slash and burn. In China, a large amount of black pottery mixed with charcoal was found in the relics unearthed from the Hemudu site more than 7000 years ago (Li 1996). To reduce the clay cohesion and increase the output of finished products, ancestors in Hemudu consciously mixed charcoal in the clay (Ma 2018). There are also records of the use of charcoal from the Shang and Zhou dynasties, which is a testimony to China’s entry into the Bronze Age and then into the Iron Age from an agricultural civilization. In 1971, charcoal was also found at the archeological site of the Mawangdui Tomb from the Han dynasty. Although the tomb owner was buried more than 2100 years ago, her body was still well-preserved when unearthed. The more than 5000 kg of a special charcoal, within the tomb is very likely to be the reason for the preservation of her body in the tomb (You 2012). Using charcoal for energy in ancient China was reflected in the poet of Bai Juyi in the Tang Dynasty. Since the modern civilization, the household application of carbon materials, from charcoal, coal, ink, dyes to preservatives, has become widespread, traditional industrial use of carbon such as electrodes, carbon black, and dynamo brushes, and carbon fiber, pyrolytic graphite and other new industrial carbon products, has also developed (Shui 2009; Yang et al. 2017; Han et al. 2019; Song et al. 2015; Cai et al. 2017). The Terra Preta in the Amazon Basin of South America is an example of applying biochar to the soil environment (Glaser et al. 2001). In the 1960s, a Dutch soil scientist, Wim Sombroek, discovered a soil rich in black matter in the Amazon basin of Brazil. The content of organic matter, nitrogen (N), phosphorus (P), potassium (K), and other plant nutritional elements were extremely high in this soil which is now called Terra Preta, meaning the black soil of the Indians (Tenenbaum 2009; Harder 2006; Marris 2006). By analyzing the soil components, archeologists found that it contained human-burned wood, ceramic carbon residue, crop residues, and bone residues from various animals including fish (Sombroek et al. 2002). The black carbon in charcoal is considered to be an important component of this black soil, which can exist in soil for 1000 years or longer (Young 1804). Its pore structure facilitates the accumulation of nutrients and beneficial microorganisms, and thus makes the soil more fertile and beneficial to plant growth (Cheng et al. 2008; Shindo 1991). Some archeologists believe that “the black soil from human activities” has unleashed a long-lasting mystery of how a large population of the Amazonian basin had access to adequate food supplies in barren jungle soils before Columbus discovered the New World (Petersen et al. 2001; Lehmann 2009). Biochar has a long history of use by humans. With widespread attention and an increased understanding of biochar, more and more researchers are trying to unify the definition of biochar. In recent years, with continuously increasing demands for food security, environmental safety, and reduction in greenhouse gas emissions, biochar has gradually been linked to soil management, sustainable agricultural development, and carbon sequestration (Lehmann et al. 2006). In the book “Biochar for Environmental Management: Science and Technology”, Lehmann (2009) defined biochar as the carbon-rich product of biomass produced by “so-called” thermal decomposition of organic materials under conditions of anoxia or limited oxygen supply, and at relatively low temperatures (< 700 °C). Currently biochar’s main uses are for enhancement of soil fertility and for carbon sequestration. In 2013, the International Biochar Initiative (IBI) revised the definition of biochar, pointing out that biochar is a solid product obtained by thermochemical conversion of biomass under anoxic conditions, which can be used alone or as an additive to improve soil fertility, increase resource use efficiency, alleviate environmental pollution, and reduce greenhouse gas emissions. 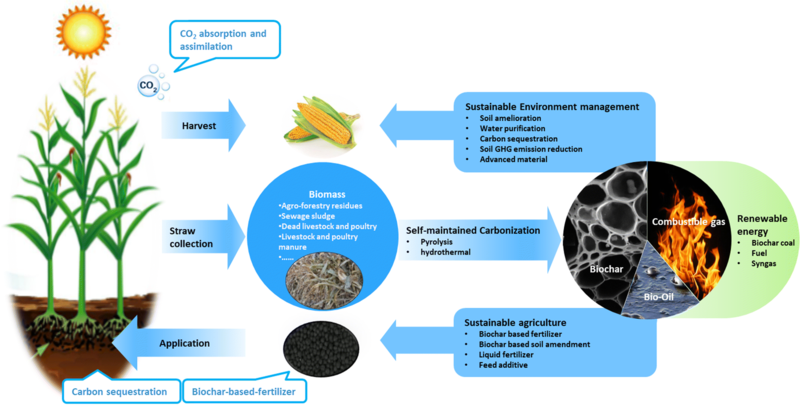 This concept focuses more on the differences between biochar and other carbon products in their application, and further highlights the role of biochar in agriculture and the environment (Fig. 1). In China, Chen et al. (2013) advocated for the strategy of returning the carbonized straw to the field in 2006, and put forward the concept of “Straw Biochar Returning” with consideration of the whole industrial chain. In this strategy, biochar-based fertilizer or soil amendment are practical pathways for application of biochar in the environment; and biochar is more clearly defined as a carbon-rich solid product derived from agro-forestry biomass waste such as straw. The composition and structure of a substance determine its characteristic and application. Exploration of the structure and properties of biochar is a prerequisite and basis for all applied research. Comprehensive research has been conducted on this aspect, and some key progress has been made in further understanding biochar. Biomass is transformed, through pyrolysis and carbonization, into carbon-rich microporous materials which have a well-developed porous structure and a high degree of aromatization (Lehmann and Joseph 2015; Chen et al. 2013). The properties of raw materials and carbonization technologies used for this process relate closely to the properties of biochar (Zhao et al. 2018). The structure of biochar products depends on the structure, inclusions, and cellulose and lignin content of the different biomasses (Lehmann 2007b). For example, the total nano-pore size of rice husk biochar is 2.1 cm3 g−1, which was 12.35 times larger than that of biochar produced from sludge (Ma et al. 2018). The carbonization temperature is also an important factor affecting the biochar structure. It is generally believed that as the carbonization temperature increases, the aromatic carbon structure and the nano-pore size of the biochar increase. However, when the temperature exceeds 700 °C, some microporous structures on the surface of biochar may be destroyed, and when the temperature exceeds 800 °C, the carbon skeleton structure of biochar will be unstable (Lian et al. 2011; Huang et al. 2014). The composition of biochar generally includes elements such as C, H, O, N, S, P, K, Ca, Mg, Na, and Si; of which C content is the highest (generally above 60%), followed by H and O. The mineral elements exist mainly in the ash (Yuan et al. 2011). The C in biochar is mainly aromatic carbon, which is deposited in an irregular stack of stable aromatic rings (Lehmann and Joseph 2015). The types of carbon compounds mainly include fatty acids, alcohols, phenols, esters, and components similar to fulvic acid and humic acid. Relatively high levels of the last two components are found in fresh biochar, low temperature pyrolytic biochar, and livestock manure biochar (Bruun et al. 2012). Nitrogen is mainly present on the surface of biochar within a C–N heterocyclic structure, and the available N content is very low in biochar (Lehmann et al. 2006). The content of P in biochar is relatively low. The P availability varies greatly, and is negatively correlated with carbonization temperature. This variation may be impacted by the high pH value and phosphates containing Ca and Mg formed during the process of carbonization (Chan et al. 2007; Cao and Harris 2010). The contents of K, Ca, Mg, and Na are different in different kinds of biochar, with the highest contents in livestock manure biochar, followed by biochar from herbaceous plants and woody plants. Low-valence metal ions such as K and Na are more available than the high-valence metal ions such as Al, Ca, and Mg in biochar. In general, the elemental composition and activity of biochar are related to raw materials, conditions of carbonization process, and pH (Chan et al. 2007; Sadaka and Boateng 2009; Silber et al. 2010). Biochar is generally alkaline, this is mainly related to the inorganic minerals such as carbonates and phosphates, and the ash formed during pyrolysis and carbonization (Yuan et al. 2011), and is also affected by factors such as raw materials and pyrolysis carbonization temperature (Lehmann 2007b). For example, the pH of leguminous biochar is higher than that of non-legume biochar, and under the same conditions of pyrolysis and carbonization, the pH of poultry manure biochar is greater than biochar from herbaceous plants, followed by woody plant biochar (Lehmann 2007a; Yuan et al. 2011). Under different pyrolysis and carbonization temperatures, the pH generally increases as the temperature rises due to the decomposition of acidic functional groups such as carboxyl and phenolic hydroxyl, and the volatilization of organic acids (Novak et al. 2009; Yuan et al. 2011; Chintala et al. 2014). The specific surface area of biochar is generally within the range of 1.5–500 m2 g−1 (Suliman et al. 2016; Li et al. 2018), and increases as pyrolysis temperature increases within a certain range (Al-Wabel et al. 2013). At relatively low temperatures volatiles, tars, and other products, from the thermal decomposition of biomass, fill the internal pore structure of biochar, and, therefore, reduce the specific surface area. As the temperature increases, these substances decompose into volatile gases and escape; reducing the pore size but increasing the number of pores in the Biochar, resulting in more microporous structures and larger specific surface areas (Bansal et al. 1988). However, the specific surface area of biochar will reach a plateau as temperature increases. When the temperature exceeds the critical value, the specific surface area decreases with increasing temperature, probably due to the destruction of microporous structure and the enlargement of micropores (Brown et al. 2006). Biochar contains a large number of functional groups such as carboxyl, carbonyl and hydroxyl groups. Most of these functional groups are oxygen-containing or alkaline, these provide biochar with good absorption ability, hydrophilicity or hydrophobicity, buffering, and ion exchange capacity (Anton-Herrero et al. 2018). The number of functional groups on the surface of biochar is closely related to the carbonization temperature. As the carbonization temperature increases, the C–O bond, C–H bond, and O–H bond content in biochar decrease; the number of oxygen-containing functional groups such as hydroxyl and carboxyl and acid groups also decrease, while the number of alkaline groups increases. In total, the number and density of functional groups decrease as the carbonization temperature increases (Gul et al. 2015; Wang 2015). Cation exchange capacity (CEC) of biochar is related to the biomass type and pyrolysis temperature (Suliman et al. 2016). In the carbonization process, some oxygen-containing functional groups such as hydroxyl, carboxyl and carbonyl are retained due to the incomplete decomposition of cellulose; increasing the biochar CEC (Lee et al. 2010). Moreover, as biochar ages, some functional groups on the surface can generate more oxygen-containing functional groups through oxidation reactions, which could increase the O/C ratio and CEC of the biochar (Clough and Condron 2010; Atkinsonc et al. 2010). Within a certain range, the biochar CEC decreases with increasing temperature (Kalinke et al. 2017), accompanied by the destruction of oxygen-containing functional groups, the reduction of the negative charge on the biochar surface, and the decrease in the O/C ratio (Lee et al. 2010; Suliman et al. 2017). On the other hand, the increase in temperature causes an increase in the content of alkali metals such as K, Ca, and Mg in biochar, which could lead to an increase in CEC (Chen et al. 2011; Kalinke et al. 2017). In general, as the temperature increases, the degree of aromatization and hydrophobicity of biochar is enhanced, the number of functional groups containing O and N is decreased, and the water-holding capacity of biochar declines (Shinogia and Kanri 2003; Moreno-Castilla 2004; Kinney et al. 2012). Studies have shown that the straw biochar prepared at 300 °C had a water-holding capacity of 13 × 10−4 ml m−2, however, when carbonization temperature was raised to 700 °C, it was reduced to 4.1 × 10−4 ml m−2 (Spokas 2010). Biochar has a high degree of carboxylate esterification and aromatization structure, high C content, very low solubility, high boiling point, high stability, and strong resistance to physical, chemical, and biological decomposition (Hammes et al. 2008; Leng et al. 2019). These characteristics allow biochar to exist in the soil for thousands of years under natural environmental conditions (Sun et al. 2018). The inherent structure and physicochemical properties of biochar have a direct or indirect impact on the soil micro-ecological environment by affecting soil bulk density, water content, porosity, cation exchange capacity and nutrient content (Chen et al. 2013). The abundant organic carbon and minerals in biochar are also beneficial for increasing soil organic carbon content (Zwieten et al. 2010; Lehmann et al. 2006; Steiner et al. 2008) and soil mineral content (Zwieten et al. 2010). Moreover, the high porosity in biochar also improves soil water holding capacity significantly (Glaser et al. 2002; Benjamin et al. 2019). Biochar’s alkaline nature supports its use as a soil amendment for acid soil and for improving soil nutrient availability (Novak et al. 2009; Masulili et al. 2010; Muhammad et al. 2018). This property also makes biochar an effective material for the ameliorating saline soil (Saifullah et al. 2018). Therefore, biochar can be used as a soil amendment because it can overcome or alleviate soil constraint factors, promote crop growth and development, suppress pathogen infestation, and reduce the absorption of harmful substances such as heavy metals and pesticides by plants (Beluri et al. 2018). Biochar can also be used as a carrier for slow/controlled-release fertilizers and microbial inoculants, which can be applied in producing biochar-based compound fertilizers, biochar-based organic fertilizers, biochar-based bio-fertilizers, etc., due to biochar’s ability in delaying the release of nutrients in the soil, reducing leaching and fixing losses, and improving nutrient utilization efficiency. The effects of biochar on crop yield depend largely on the amount of biochar applied and the soil types. Biochar has a positive effect on crop yield in general, and it is more effective when applied to low to medium fertility or degraded soil rather than to fertile or healthy soil (El-Naggar et al. 2019). Lehmann et al. (1999) applied biochar to soil at a rate of 68 t ha−1 and 135 t ha−1, and found that the biomass of rice and cowpea increased by 17% and 43%, respectively. Uzoma et al. (2011) applied biochar at a rate of 15 t ha−1 and 20 t ha−1 to the sandy soil where maize was grown and found that the crop yield was increased by 150% and 98%, respectively. The positive effect of biochar on crop biomass and yield has been found to accumulate with time. Major et al. (2010b) conducted a multi-year experiment in a maize–soybean rotation system, and found that the maize yield was not increased in the 1st year when biochar was applied at 20 t ha−1. However, the yield was increased by 28%, 30%, and 140% compared to the control in the following 3 years, respectively. Field research conducted in the Amazon River basin in Brazil also showed that an 11 t ha−1 of biochar application increased the grain yield of rice and sorghum together by 75% after four growing seasons in 2 years (Steiner et al. 2007). In addition to studies on the interaction between biochar and soil, the interaction between biochar and fertilizers has also attracted the interest of researchers (Yamato et al. 2006). In China, in particular, researchers have mixed biochar with fertilizers and invented biochar-based fertilizers, which increase crop yield significantly. For example, the biochar-based fertilizer specifically for peanut increased its yield by 13.5% due to extended functional duration of leaves; a biochar-based fertilizer developed specifically for maize increased its yield by 7.6–11.6% due to increased grain number and weight; and a biochar-based fertilizer designed for soybean increased its yield by 7.2% due to increased branch number, grain number per plant, and 100-grain weight (Cui and Chen 2008; Cui et al. 2008; Chen et al. 2008). In summary, the effect of biochar on crop yield depends not only on biochar’s characteristic and function, but also on soil conditions and ways to apply biochar. Only by adapting to local conditions, and by knowing the soil constraint factors, can the advantages of biochar be fully used for farmland management. Biochar can improve the digestion and metabolism of nutrients in animals, thereby improving animal growth performance. For example, an increase of biochar in the feed improved the protein levels in the muscles of Nile tilapia (Boonanuntanasarn et al. 2014); the application of 2% biochar in the feed significantly increased the specific growth rate of catfish and reduced ammonia nitrogen emissions (Quaiyum et al. 2014); application of bamboo charcoal significantly increased the specific growth rate, feed conversion efficiency, and protein efficacy ratio of flounder (Thu et al. 2010); a supplement of wheat straw bio-charcoal to fodder reduced the deposition of abdominal fat, lowered total cholesterol in serum and triglyceride levels, and to a certain extent, improved the growth performance of broilers (Fu et al. 2015). Similar results have also been found in turkeys (Majewska et al. 2009) and goats (Villalba et al. 2002). Biochar and its by-product wood vinegar have disease resistance and anti-bacterial effects. Dietary charcoal powder including wood vinegar, as a feed additive, improved the feed utilization efficiency of piglets (Mekbungwan et al. 2004), promoted piglet growth (Han et al. 2014), and increased the average daily weight gain of ducks (Ruttanavut et al. 2009). The adsorption of toxic substances by biochar is thought to improve disease resistance and promote the healthy growth of animals. Kana et al. (2010) reported that dietary plant charcoal from Canarium schweinfurthii Engl. seed and maize cob alleviated the decline in average daily feed intake and intestinal-specific weight of broiler chickens caused by aflatoxin B1 toxicosis. Watarai and Tana (2005) found that the carriage of Salmonella enterica serovar enteritidis was eliminated in domestic fowls and the damage to its intestine was reduced by feeding activated charcoal from bark containing wood vinegar. Besides, adding 1% biochar including wood vinegar in feed improved the immunologic function and anti-stress ability of piglets (Han et al. 2014). Moreover, biochar can purify aquaculture water (Qi et al. 2012) and wastewater of aquaculture (Wu et al. 2010), contributing to the healthy development of animal husbandry. Biochar has become a focus of soil environmental research as a result of its potential for increasing soil carbon sinks, reducing greenhouse gas emissions, remediating contaminated soils and alleviating the pressure of straw burning. The carbon framework of biochar is stable and difficult to decompose, and it can be immobilized by soil and transformed directly to carbon sinks in the soil (Cao and Pawłowski 2013). Biochar has a profound impact on the transformation processes of carbon and nitrogen in the soil. The application of biochar reduces soil CO2 emissions due to a negative priming effect (Zimmerman et al. 2011; Chintala et al. 2014; Cross and Sohi 2011; Major et al. 2010a; Steinbeiss et al. 2009; Sagrilo et al. 2015) and N2O emissions are reduced significantly through various mechanisms (Jia et al. 2012; Renner 2007; Cayuela et al. 2014). These mechanisms include that (1) the proportion of N2O transformation to N2 during denitrification is changed due to the change of pH (Sun et al. 2014); (2) the abundance of soil microbes is changed (Zhu et al. 2017), in particular, the increase in the growth and activity of microorganisms involved in denitrification (Bruun et al. 2011); (3) the adsorption ability of soil to NH4+ or NO3− is improved (Kettunen and Saarnio 2013; Van Zwieten et al. 2010; Case et al. 2012); (4) soil aeration is enhanced and the denitrification rate is reduced (Rogovska et al. 2011; Augustenborg et al. 2011). In general, biochar demonstrates a significant effect on soil N cycle, although the effects are not exactly the same across various studies due to the differences in soil characteristics, management practices, and application methods (Clough et al. 2010; Wang et al. 2012; Quin et al. 2014). In a rice cropping system, biochar reduced soil CH4 emissions significantly (Feng et al. 2012) and increased soil net absorption of CH4 (Khan et al. 2013). However, other studies showed that biochar increased soil CH4 emissions (Zhang et al. 2010), which was probably because biochar provided a substrate for methanogens (Zhang et al. 2013) or inhibited the activity of methane oxidizing bacteria (Spokas and Reicosky 2009). Contamination control using biochar has been researched for a long time (Shaheen et al. 2019). Biochar mainly affects the bioavailability of heavy metals in the soil through adsorption; the adsorption includes both chemisorption and physisorption. Biochar is highly aromatized and highly porous (Yang et al. 2019; Zhang et al. 2019a, b). When heavy metal ions are close to the benzene ring, the electron cloud of benzene ring can be polarized and produce a weak electrostatic effect, which leads to physisorption (Gomez-Eyles and Ghosh 2018). Biochar accomplishes chemisorption of heavy metals by surface functional groups (Xia et al. 2019). Besides, biochar is more alkaline and can significantly increase soil pH, which indirectly reduces the bioavailability of heavy metals (Huang et al. 2018a, b). In addition, biochar can alter soil moisture condition and aeration, and affect soil redox potential, thereby changing the toxicity of some charge-sensitive toxic heavy metals such as cadmium (Bogusz et al. 2017). It is noteworthy that the passivating function of biochar on bioavailability is not effective on all heavy metals. Biochar can also adsorb various organic pollutants such as polycyclic aromatic hydrocarbons, polychlorinated biphenyls, naphthalenes, and phenols; and affects the transport and fate of pollutants (He et al. 2018). The adsorption mechanism of biochar on organic pollutants mainly includes partitioning, surface adsorption, pore retention, and microscopic adsorption (Huang et al. 2018a, b), but the adsorption process is usually governed by the combination of several mechanisms. Carbonaceous materials, degree of aromatization, elemental composition, pH, pore structure, surface chemistry, etc., of biochar plays important roles in its ability to adsorb organic pollutants (Chen et al. 2019), which leads to complex adsorption mechanisms when different kinds of biochar adsorbs various organic pollutants with different characteristics. At present, most biochar studies focusing on the mechanism of adsorption of organic pollutants are at a qualitative level; while quantitative research on structure–activity relationship is gradually being carried out (Chiou et al. 2015). However, the mechanism of reducing the bioavailability of organic pollutants by biochar is still difficult to quantify in the soil environment since it involves complex microbial metabolic processes (Zhu et al. 2017). Currently, there is a lack of in situ or long-term and multi-year experiments studying the roles of biochar in inorganic or organic pollution remediation, and there is no successful case of applying biochar and related products for remediation practice on a large scale. Therefore, the research on the mechanism of environmental remediation of biochar will remain a hot topic for a long time, and biochar modification or combination with other remediation methods may be an ideal strategy for accelerating the applied research of biochar. The use of charcoal as a high-quality energy source is quite common even after the emergence of coal and oil. Biochar has desirable fuel properties, exhibiting comparable H/C and O/C ratios and calorific value to coal (Abdullah and Wu 2009). Physicochemical properties and combustion characteristics of biochar largely depend on the biomass feedstocks and carbonization processes. Zhao et al. (2014) evaluated the flammability of 34 biochar samples although they were not defined as flammable materials and reported that 71% of the fast pyrolysis biochar samples had a higher burning distance, while no burning distance was observed for 80% of slow pyrolysis biochar samples. Given this, they indicated that volatile content played an essential role in determining the flammability of biochar. Functional group type and biochar surface area also impacted on the ability of biochar to react with oxygen. Several studies showed that compared with clean and pulverized coal, higher calorific value and similar combustion properties of biochar could be obtained through optimizing the pyrolysis process and increasing the specific surface area by reducing particle size, respectively (Wijayanta et al. 2014; Jiang et al. 2018). Increasing evidence from studies on mixed combustion of biochar and coal revealed that biochar could effectively reduce the ignition and burnout temperatures of fuel mixtures and improve their conversion efficiency and combustion characteristics (Mi 2018; Wang et al. 2018; Toptas et al. 2015). This demonstrated that biochar could be used for co-combustion of fire coal for large boilers in the future. Biochar molding has been proposed to be a practical energy strategy to improve volumetric energy density of powdered biochar and reduce the formation of particulates during combustion. Chen et al. (2011) developed “carbonized bio-coal” to replace fossil fuels in China’s rural energy upgrading process. This new type of coal could be widely adopted by small households for energy supply and by large-scale central heating systems, as it is environment-friendly and has superior combustion performance, Compressed biochar with shapes shows superior combustion properties (Zhu et al. 2018). It should be pointed out that moisture content, molding pressure, holding time of pressure, and type of adhesion agents significantly affected the breaking strength, dimensional stability, and combustion characteristics of compressed biochar (Chen et al. 2016; Bazargan et al. 2014). A bio-oil/biochar slurry (also known as bio-slurry) is a new fuel product of suspending fine biochar particles in pyrolysis bio-oil (Wu et al. 2010). This product can help overcome some constraints in biomass utilization including high transportation costs, poor grindability, and mismatched fuel properties when it is co-processed with coal. Kichatov et al. (2018) reported that overall burning rate of foamed emulsions was increased significantly when biochar microparticles were added. In addition, technologies to produce hydrogen-rich syngas by steam gasification of bio-slurry (Sui et al. 2015; Chen et al. 2015) or by steam/CO2 gasification of biochar have been developed (Jia et al. 2018; Kraisornkachit et al. 2018). Raw materials, particle size, and catalysts are becoming key research topics for the development of the technology for producing hydrogen-rich syngas by steam gasification of bio-slurry. Direct carbon solid oxide fuel cell (DC-SOFC) is an all-solid-state device that directly converts chemical energy of carbon fuel into electrical energy. It is feasible to use raw biochar as a fuel in direct carbon fuel cells (DCFC) or hybrid carbon fuel cells (HCFC) (Jafri et al. 2018; Kacprzak et al. 2016). Biochar as an electrode or catalyst has a promising prospect in microbial fuel cells (Deng et al. 2018; Huggins et al. 2016). In addition, biochar has shown great potential as an electrode material used directly or indirectly for the production of electrochemical energy storage devices such as supercapacitors (SC) and lithium ion batteries (LIB) (Caguiat et al. 2018; Liu et al. 2017; Gao et al. 2017; Guo et al. 2015). Technologies for biochar production generally include pyrolytic carbonization, gasified carbonization, hydrothermal carbonization, flash carbonization, and baking carbonization (Zhang et al. 2019a, b; Meyer et al. 2011). In pyrolytic carbonization, biomass is decomposed at high temperatures of 300–900 °C (generally < 700 °C) in the absence of oxygen or with limited oxygen supply (Lehmann and Joseph 2015). In this process, the proportion of the end products, in the form of gas, liquid and solid is relatively balanced. Gasified carbonization is a process in which a gasification reaction occurs at high temperature (> 700 °C) and under a controlled supply of oxidant (oxygen, air, steam or a mixture of these gases) to produce a gaseous mixture with minor amounts of liquid and solid products. Biochar produced by gasified carbonization has a higher degree of aromatization compared with pyrolytic carbonization (Zhang et al. 2019a, b; Meyer et al. 2011). Hydrothermal carbonization is an approach to produce biochar–water slurry mixture by suspending the biomass in high-pressure water at a lower temperature (150–375 °C) for several hours. Biochar obtained by hydrothermal carbonization is mainly composed of alkane structures that have low stability (Zhang et al. 2019a, b; Weber and Quicker 2018). Flash carbonization is generally carried out at a reaction temperature of 300–600 °C for no more than 30 min, with mainly gaseous and solid products as output (Wade et al. 2006). Baking carbonization, also known as mild pyrolysis, is used to manipulate biomass by thermochemical treatment with a low heating rate of less than 50 °C min−1 at a lower temperature (200–300 °C) and under anoxic or anaerobic conditions (Kambo and Dutta 2015; Fan et al. 2018). Clearly, biochar provides substantial environmental, social, and economical benefits. However, it is difficult to evaluate advantages and disadvantages of various technologies of biochar production because of data unavailability. Among the above-mentioned biochar production systems, pyrolytic and gasified carbonization have the highest economic feasibility and technological maturity (Meyer et al. 2011), and thus are becoming the dominant technologies for biochar production. Furthermore, pyrolytic carbonization has attracted more attention because of its potential for climate change mitigation. There are many types of processes and equipment for biomass pyrolytic carbonization (Cong et al. 2015; Meng and Meng 2016). They can be classified into external heating, internal heating, and self-ignition based on heat source; batch-type and continuous processing systems based on continuity of operation mode; and slow, normal speed, and fast pyrolysis carbonization based on heat transfer rate. Among them, slow pyrolysis carbonization is a traditional processing system with a low heating rate and a solid residence time ranging from hours to days, which is mainly used to produce charcoal. The solid residence time generally lasts 5–30 min in normal speed pyrolysis carbonization, which produces relatively balanced products in the forms of gas, liquid, and solid. Fast pyrolysis carbonization has a high heating rate, resulting in heating raw materials of fine-particle biomass (1–2 mm) up to 400–700 °C in a short time. Notably, this processing system with the target product of bio-oil requires the moisture content of the raw material to be below 10% and has a short gas residence time (< 5 s). Presently, equipment for normal speed pyrolysis carbonization has been widely employed for commercial production of biochar. To a certain extent, polygeneration is achieved for biochar production. The following are some polygeneration systems. A pilot-scale rotary kiln continuously producing 600 kg of biochar per hour has been established in Henan and Guizhou provinces of China. This kiln starts working with the heat of natural gas and is maintained with syngas from biomass pyrolysis in situ. Syngas is burnt without intermediate purification, and no bio-liquid is left. Besides a self-maintainable pyrolysis process, the heat can be used for drying biochar-based fertilizer. This equipment is fed with small sized biomass with good flow ability, such as peanut shell and rice husk, or other biomass pretreated into similar size. Rotary and batch kilns can produce bio-liquid as a by-product with added syngas purifier. Typically, a water cooling module is used in different forms. It is worth noting that the bio-liquid can substitute for water after a solid–liquid separation during the pyrolysis production. A semi-closed sub-high-temperature anoxic carbonization furnace is effective in co-production for biochar, bio-liquid, and heat. Unlike external heating process, this equipment relies on internal heating or so-called smoldering to maintain the pyrolysis process. In some companies in Liaoning and Jilin province of China, a similar semi-closed kiln is widely applied on the account of its high compatibility with a raw material that has low flow ability, such as roughly pretreated corn stalk. Spare heat could be used for drying the material and for residential heating. Bio-liquid could be used to quench the biochar or serve as a component in biochar-based fertilizer. In Anhui, Hubei, Hebei and some other provinces of China, a semi-closed biochar kiln of 0.5–3 MW internal combustion generator was widely adopted to make biochar from rice husk or apricot stone. Theoretically, steam turbine generator can lower purification requirement and can be easily maintained, but no application for straw biochar has been reported. Generally, in addition to small-scale equipment developed for barbeque char, the prices of large-scale biochar kilns vary from 0.6 to 6 million RMB (a Chinese currency) corresponding to the capacity of biochar production ranging from 3 to 14 tons per day. From a historical point of view, biochar has been closely related to human civilization since the Paleolithic era of slash and burn. Compared with the practical use of biochar, the biochar research is really just in its infancy. Even though enormous progress has been achieved in biochar research since the beginning of the twenty-first century, there are still many questions to be answered. For example, no standard has been established for the description of biochar’s basic characteristics. Moreover, most of the research has focused only on determining the impacts of the raw material and carbonization process on the properties of the biochar. Methodology is limited in determining the quality, quantity, and microscopic conformation of biochar in the soil. The effects of biochar on soil, crops, and environment were studied mainly in short-term and simulated experiments but not in long-term field experiments. To date, no major breakthrough has been achieved in the research areas of biochar amendment and biochar-based fertilizers. In view of the above problems, it is necessary to advance the development of biomass carbonization technology and modern equipment; to improve carbonization efficiency, quality of the biochar product, and the utilization of by-products to reduce production costs. It is also necessary to strengthen the basic research of biochar in the areas of agriculture and environment and innovated research of biochar in the areas of soil management, crop production, carbon sequestration and emission reduction, pollution control, and discovery of new materials. In line with that research, environmental risk assessments and cumulative feedback effects of biochar application need to be completed. To make it available, traceable, and controllable a standard system for biochar research protocol, biochar production technology, and biochar products needs to be established and a standardized management system needs to be applied across the whole biochar industry chain. Nature gives humanity an environment in which people live and multiply. However, the excessive consumption on natural resources and environmental destruction associated with human activities have already posed a burden on sustainability of the natural environment, which forces humans to bear the punishment from nature. Biochar is closely related to agriculture, environment and sustainable development. The beautiful vision of harmony between people and natural environment can be realized in the process of promoting “carbon to biochar” transition. Therefore, for the future of human survival, sustainable and healthy development of society, it is our responsibility to explore the future of biochar by strengthening the research and development of biochar. This work was supported by the Earmarked Fund for Modern Agro-industry Technology Research System, China (Project No. CARS-01-46), the National Key Research and Development Program, China (Project No. 2017YFD0200800), the Innovative Talents Promotion Plan of Ministry of Science and Technology, China (No. 2017RA2211) and the Project of Promoting Talents in Liaoning Province, China (XLYC1802094). We thank Kim McGrouther for her constructive comments on the manuscript.